Felipe Tobar is a Conicyt research fellow in Machine Learning and Signal Processing working in the Center for Mathematical Modeling at Universidad de Chile. Between September 2014 and July 2015, he was an associate research at the Machine Learning Group, University of Cambridge. 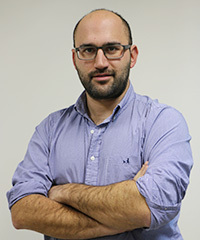 Felipe holds a PhD in Adaptive Signal Processing from Imperial College London (2014), and BSc (2008) and MSc (2010) degrees in Electrical Engineering from the Universidad de Chile.